Being a parent can often feel like you’re trapped in a minefield of worries and sales pitches. You can’t trust what is good or bad for your child any more. Every manufacturer is out to tell you that their product isn’t only safe, but is actively beneficial for your kid. And though some decisions, like going organic, are obvious, selecting the right product is still hard. As a parent to a seven month old myself, I’ve been through all that and can confidently tell you these are the best organic baby shampoos around. 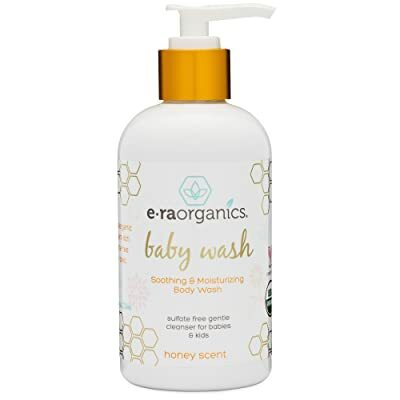 This is a great organic baby shampoo. In terms of cost it is below average, but that doesn’t mean you get below average results. Our baby had some quite nasty cradle cap when we bought this, and it was recommended to us as safe to use on sore scalps. It was very gentle and helped remove the flakes cleanly. We didn’t see any signs of discomfort as we let it soak in, either. It foams very well from just a few drops, so we knew we had great coverage without ever overloading it. The fragrance might put some parents off, but rest assured that it fades once dry and is very mild. It isn’t advertised as no-tears but he got some on his face and had no problems. Mostly natural (but they do confuse it by using some technical names for plant extracts). Didn’t make our baby cry. Didn’t sting his cradle cap. Some items on the list don’t look fully natural. Fragranced, which might put some people off. This one is one of the most expensive we tried, but worked so well we have to admit it’s one of the best on the market. When we first found out about our son’s cradle cap, we tried this as a form of relief. It also worked gently on his diaper rash. Although all of these products are marketed as hair and body, we found this one really delivered in both departments. It’s completely natural and PH neutral too, which was brilliant to know. And the USDA Organic certification reassured us that what we were buying was genuine. My only complaint is that because it worked so well all over, we burnt through this tiny 8oz bottle in no time. Hair and body, little hands, and now even sticky fingers from snacking get cleaned with it. Great for sore or damaged skin. Not tear-free. Keep this out of your baby’s eyes. Coming in at around 35 fluid ounces, this was amazing value for money, and meant we still haven’t needed another bottle. It’s all natural, completely vegan, and unscented too. Being completely natural it isn’t no-tears, so we used a self-foaming bottle as they recommended. It doesn’t really make much foam, though, and after a few uses we started getting less foam and more goop. We switched onto one of those nifty rubber hats that keep soap off baby’s face. Although it has no added fragrances, it does have a fairly strong but pleasant smell when you use it. The smell fades as baby’s hair dries. It alleviated some of the redness from his cradle cap, but didn’t do much to fight the flakiness or the diaper rash. Good for hair and cradle cap. The pump doesn’t work great. The natural smell is strong. Not as good for body. This is usually very good value for money. It is very natural, but not completely free of artificial products. It is, however, free of animal products and PH neutral. 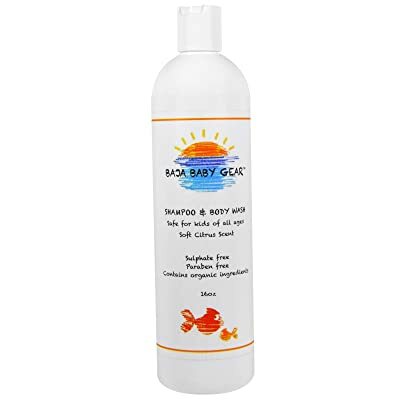 We found it helped fight cradle cap and remove the flakiness. But our son’s hair was a little thicker and shinier after using it. He didn’t have much hair at the time so we can’t say for sure if it was a healthy shine or a greasy one. But it is our experience that many natural shampoos don’t cut through grease like more artificial brands do. An added benefit of some of its artificial ingredients is that it is no tears and it foams wonderfully. You can really fill the bath with bubbles and let little ones splash about without any worries, which is wonderful. But it did have a very soapy smell and texture. Might not fight grease well. This is a curious product, because it really didn’t check all our boxes at first, but we do love it. It’s not completely natural. But the artificial ingredients make it really sudsy, tear-free, and a wonderful moisturizer. When our son got some rough patches on his legs and knees this wash really helped to smooth them out and remove dry skin. It is also medically tested and developed by doctors, which inspires confidence. Although it is scented, the scents are natural essential oils, not artificial fragrances. And almost everything in it is food-grade, and it’s free of sulfates, so you know it’s basically harmless. We found it was gentle on his skin, made mountains of suds, and didn’t irritate his eyes or cradle cap. It actually lifted a lot of the flakes off, which was probably due to the coconut oil in it. To boot, his hair was so silky afterwards, and the fragrance is mild, pleasant, and sticks. Leaves fragrance on your baby’s hair. When buying a good baby shampoo, the first thing to remember is that organic doesn’t always equal natural, or even good! Some other products we tried were completely organic, but irritated his skin and made his cradle cap flare up. One in particular might have caused the rough patches on his legs and feet. So be sure to check the ingredients’ list and relevant reviews by skin-safety organizations. The ones we listed were all gentle and safe for skin and hair, so any of them should work for you, but if they don’t, try and stick to the ones that are completely natural. Always consider your baby’s skin and needs first and foremost, though. Although many artificial ingredients can be irritants, plenty of them are perfectly safe. And many artificial ingredients are moisturizing, gentle, soothing, and highly beneficial. You also have to bear in mind that it is impossible to get a grease-fighting, sudsy, no-tears formula without artificial ingredients. Natural products can cut grease a little, and make a mild lather. But you will never get piles of powerfully grease-removing, tear-free bubbles without allowing some artificial stuff. And finally, be sure to check out potential allergens, and test the shampoo lightly on various areas of skin before using it. A drop of lather on the scalp, back of the hand, cheek, and on any damaged skin is enough. Let the drop sink in a bit, rinse it off, and check for the next six hours to see if a redness or itchiness develops. Babies can be allergic even to natural and organic ingredients, so you need to make sure it’s fine before you use it properly. 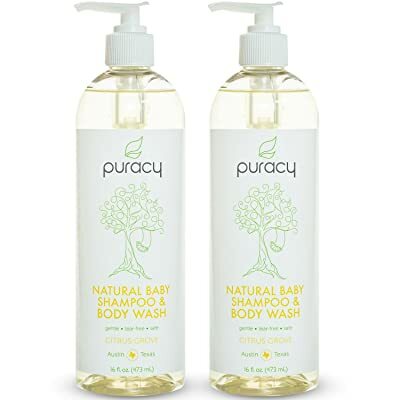 As you’ve probably guessed, our favourite is Puracy Natural Baby Shampoo & Body Wash. At first we were actually a bit wary of ones that weren’t completely natural, but this shampoo blew us away. The fragrances are natural, as are the active ingredients, and it’s sulfate-free, so the essentials are covered. But it has just the right artificial ingredients. Without them it wouldn’t be as hydrating, sudsy, or tear-free. All round it is wonderful and we’re probably going to use it for years to come.